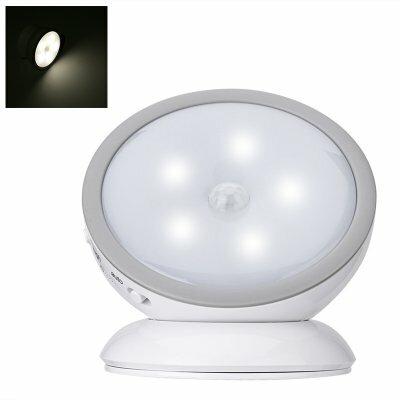 Successfully Added LED Nightlight - 360-Degree Rotating Design, Energy Efficient, Low Power Consumption, 451 Lumen, 4M Motion Detection to your Shopping Cart. This simple LED nightlight will lighten up your room and or hallway at night so that you’ll never be left in the dark again. It features an intergraded motion sensor that detects movements up to 4 meters. Whenever movement is detected, this small LED light will switch on automatically. From now on, you’ll never again have to search for your light switch in the dark. This durable light source features a high-end design. It is IP34 rated which means it protected against humidity and slight splashes of water. The light itself brings along thousands hours’ worth of service life. Thanks to this, you’ll be able to enjoy a lit up room for years to come. What really sets this LED light apart from regular night lights is its 360-degree rotating design. The light itself features a ball shape and is attached to the stand by means of a magnet. This means that you’ll be able to rotate your light and aim it in any direction imaginable. It does not matter where in your room you attach this small LED light, you’ll always be able to aim it at the spot where light is needed most. This little gadget comes with adhesive tape which lets you easily install it anywhere within your home. It runs on a battery so you won’t have to bother with any cables when installing this stylish LED light. Reaching up to 451 lumens, this night light is capable of illuming a large area. The LED is environmentally friendly and has low power consumption. Additionally, it generates virtually no heath while in use. When in use, it does not produce any UV or IR radiation. This means that you’ll be able to enjoy this light source in a cheap and healthy manner throughout the night. With this 0.5W LED night light in your household, you’ll always be treated with lit up rooms and hallways whenever you move after dark. Arabic: - ضوء الليل الصمام - Chinese Simplified: - LED 小夜灯 - Czech: - LED noční světlo - Danish: - LED natlys - Dutch: - LED nachtlampje - French: - Veilleuse LED - German: - LED-Nachtlicht - Hebrew: - מנורת LED הלילה - Hindi: - एलईडी रात को प्रकाश - Italian: - Luce notturna LED - Japanese: - LED ナイトライト - Korean: - LED 나이트 라이트 - Malay: - Cahaya malam LED - Norwegian Bokmål: - LED nattlys - Romanian: - LED-uri Night Light - Russian: - Светодиодные ночь свет - Spanish: - Luz de noche LED - Thai: - ไฟกลางคืน LED - Turkish: - LED gece lambası - Vietnamese: - Ánh sáng LED ban đêm. Excellent night light. Was pleased that it is rechargable as well as having 3 AAA batteries for when the rechargable battery goes down. Difficult to decide where to locate it and the light is very bright for a night light.